To begin with a familiar type of situation, a patient who is dying of incurable cancer of the throat is in terrible pain, which can no longer be satisfactorily alleviated. He is certain to die within a few days, even if present treatment is continued, but he does not want to go on living for those days since the pain is unbearable. So, he asks the doctor for an end to it, and his family joins in this request. Suppose the doctor agrees to withhold treatment… The justification for his doing so is that the patient is in terrible agony, and since he is going to die anyway, it would be wrong to prolong his suffering needlessly. But now notice this. If one simply withholds treatment, it may take the patient longer to die, and so he may suffer more than he would if more direct action were taken and a lethal injection given. This fact provides strong reason for thinking that, once the initial decision not to prolong his agony has been made, active euthanasia is actually preferable to passive euthanasia, rather than the reverse. Is killing someone worse than letting them die? Rachels asks us to consider these two cases: In the first Smith will gain a large inheritance if anything should happen to his young cousin. One evening while the youngster is taking a bath, Smith sneaks into the bathroom and drowns the child, and then arranges things so it will look like an accident. In the second parallel case, Jones will gain a large inheritance and plans to drown his cousin, but as he enters the bathroom Jones sees the child slip and hit his head and fall face down in the water. Jones watches and does nothing. Now, Smith killed the child while Jones 'merely' let the child die. Rachels' question: did either man behave better, from a moral point of view? "If the difference between killing and letting die were in itself a morally important matter, one should say that Jones's behavior was less reprehensible than Smith's. But does one really want to say that?" If the crucial issue in the euthanasia debate is the intentional termination of the life of one human being by another, then how can it be consistent to forbid mercy killing and yet deny that the cessation of treatment is the intentional termination of a life? What is the cessation of treatment if it is not the "intentional termination of the life of one human being by another"? The so-called distinction between active and passive does not provide a useful moral distinction. Perhaps a notion of "human dignity" will assist in our consideration of what we ought to do. 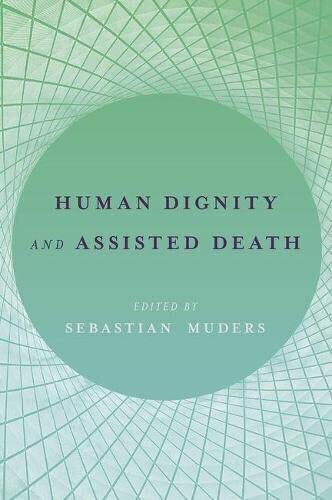 In the collection of papers that constitute this welcome addition to the philosophical conversation about the complicated issues of "human dignity" and "assisted death" several philosophers wrestle with these complications. They include: a useful introduction by the editor; a section on human dignity and the case for assisted death; a section on dignity at the end of life; a section on dignity and disability; a section on dignity and autonomy; another on dignity and the value of life; and a concluding section on dignity and rights. Each of the five sections has two essays which lay out the problems and attempt to present arguments on the various positions raised by the section title. The discussions and arguments are subtle and complex, but the writing is overall clear and engaging. The book will serve well as a text in a bio-ethics course for upper-level classes. Considering the questions raised by any topic in ethics is a difficult task because the questions are complicated, the language often technical, and the issues raised sometimes seem so alien to lived experience. For example, in the book before us, we are struck by the gap between what is the case in our human story and what philosophers argue ought to be the case. What is the case? Today's headlines and stories about immigration in North America and Europe – "they are all drug dealers, rapists, and criminals" say nothing about human dignity, but attempt to describe in a way that carries the value judgment with the description. One of the concerns in the book is the way language works - as not a value-free tool but a carrier of unargued and unjustified value judgments. The is/ought distinction is central to the fact/value discussion and is the backbone of the topics raised in the book. I believe it important to give the prospective reader a sense of the breadth of the contributions to the book by these authors: Margaret F. Battin, Holger Baumann, Michael Cholbi, Rebecca Dresser, William F. Fitzpatrick, Robert P. George, Luke Gormally, Christoher Kaczor, Jeff McMahan, Sebastin Muders, Peter Schaber, Ralf Stoecker, L. W. Sumner, and David Wasserman. Together they represent European and North American medical ethicists and practical philosophers with expertise in healthcare and end-of-life care. Together they discuss a comprehensive list of problems including: legal vs moral; societal beliefs and practices vs what ought to be; human beings vs other species (what if anything is special about humans); human dignity – is it a meaningful concept or just a fluid phrase used to advance a position? What is suicide? Intention vs action? And so on . . . This is an important book which contributes to the complicated discussion about the importance of human dignity in life and in choosing one's death. All of us "immigrants" (and, aren't we all immigrants?) can benefit from reading it! Let me conclude with a lengthy quote from one of the best essays, "Could Suicide Really Be a Fundamental right? A Triple Threat" by Margaret F. Battin, who looks back on her own work as a young philosopher and compares that work to what she has learned over time. This is a good book. I highly recommend it for thinking carefully about important issues. Bob Lane is Professor Emeritus Philosophy at Vancouver Island University and the author of an essay in Assisted Suicide edited by Karen F. Balkin, published by Greenhaven Press.